Horse trailer repair – sometimes it is more economical to buy a used stock or horse trailer and repair it, than it would be to buy a brand new stock or horse trailer. We bought a used gooseneck stock trailer. The axles were bent and it needed a new floor but the trailer itself was still in very good shape. Horse trailer repair should start from the ground up. We found that having the axles straightened was not a great big deal. There is a local spring and axle place about an hour away that could straighten them in a day and it wouldn’t cost too much. We had the technician replace all the bolts and shackles as well. Straightening the axles was the very first step in preparing for the floor replacement. The most common type of horse trailer repair is floor replacement. After the axles were straightened, it was time to get moving on the floor replacement. It was a little bit bigger job than we had planned. Having a spare horse trailer or a borrowed horse trailer during this type of repair is recommended. Make sure you know the size of the boards that are needed. We replaced our floor with treated 2″x 6″ lumber as long as the trailer. Our trailer floor boards ran lengthwise and needed to be one board front to back the entire length of the trailer. Putting small pieces or half the length at a time is only asking for trouble and will be too weak. 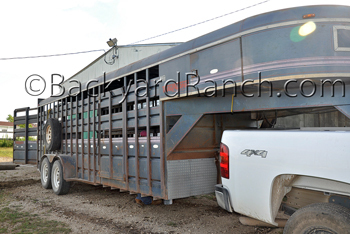 The horse trailer bounces more than your truck going down the road. The horses need to be on a solid floor. We wanted to make sure that this floor lasted as long as possible with all the work we were putting into it. When replacing the floor during horse trailer repair, make sure that you use treated lumber, it will take the weather and excrement longer. 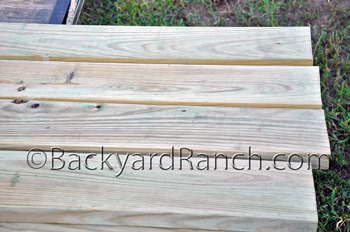 Rough cut lumber is ideal if available. Make sure to get the treated lumber tight together when replacing the floor, the boards will dry and there will be some shrinkage. If you are using new boards, you absolutely don’t want any gaps between the boards. Use a rubber mallot to move the lumber as together as possible. If you have too big of gaps between the brand new boards, the boards will dry out and shrink slightly. When the boards dry out there will be even more space between them enough for a loose lead rope or reins to get pulled through the floor and wrap around the axle or the tire of the trailer. Your horse will most likely be seriously injured or killed if that were to happen. 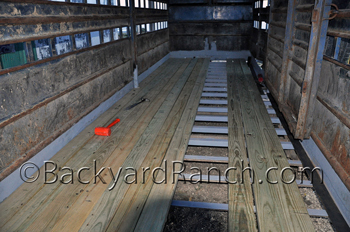 See our horse trailer repair floor replacement -part 2 page for more of our process!